The Republic of Cuba is an archipelago nation in the Caribbean made up of the island of Cuba, the Island of Youth, and 1,600 smaller islands and keys (World Health Organization, 2014). Currently, its population is approximately 11,225,314 people (Country Meters, 2015). Havana, the capital, has a population of around 2,163,824 (World Population Review- WPR, 2015). Nowadays, Cuba is strongly dependent on external financial assistance after many years of Communism and limited economic growth (Hofmann, 2004). The poor economic situation has further aggravated the social and environmental structure of Cuba. Recently, the scope of Cuba’s poverty and the poor sanitation of the island have attracted world attention. International authorities and researchers have identified the lack of wastewater collection and treatment as a major public health concern since malfunctioning or non-existent systems can facilitate the dissemination of infectious diseases. The lack of appropriate sanitary infrastructure has caused damage to marine, brackish and freshwater environments and to fisheries (Wright, 2014). This also contributes towards the spread of disease such as hepatitis A, diarrhea, and leptospirosis, which are common waterborne diseases in Cuba (Navy Medicine, 2010). The importance of wastewater systems to a city’s public health and well-being is unquestionable. For this reason, a qualitative analysis of the wastewater treatment systems in Havana was conducted. 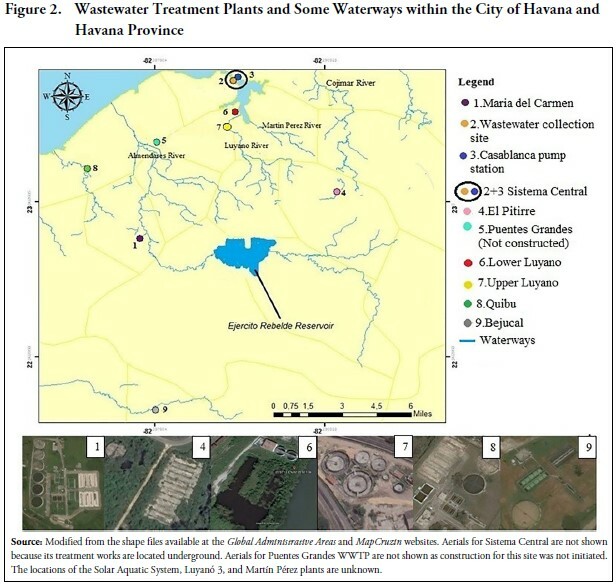 The purpose of this study is to discuss the wastewater infrastructure of Havana and propose cost-effective improvements which could control transmission of disease and negative ecological impacts. Our study was limited by the lack of available information regarding the wastewater infrastructure of Havana. 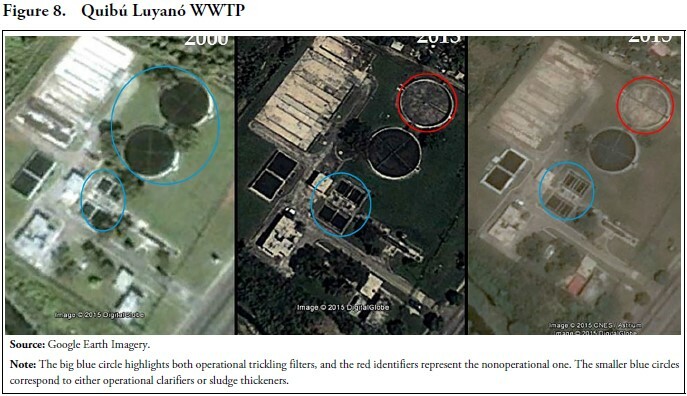 To get information about this system, four of Havana’s and two of Havana Province’s Wastewater Treatment Plants (WWTPs) were observed via satellite imagery Google Earth Pro and compared to images from previous years in order to determine if any changes could be identified visually. The satellite showed us positive improvements in some WWTPs as well as some negative changes over time. The Cuban sanitary system is basically comprised of public wastewater collection systems, septic tanks and latrines (PAHO, 2000). However, most of the current sewer system was built 50 or more years ago, and it has not been well maintained throughout its service life (Cueto and De Leon, 2010). For this reason, Cuba has faced wastewater contamination of its waterways, and a high percentage of its population does not have access to a wastewater collection network system. Wastewater treatment in Cuba does not quite reach the entire population. In 2005, approximately 95% of the total Cuban population was serviced by some kind of wastewater system, but not all systems were working satisfactorily. Of the population serviced by wastewater systems, 56% was serviced by sanitary latrines and/or septic tanks, 38% was serviced by collection network systems and 6% was without service. Of these percentages, only 8% of the rural population was serviced by a sanitary sewage system, 76% was serviced by septic tanks and latrines, and 16% was without service (PAHO, 2000). One of the most common forms of wastewater treatment in Cuba is stabilization lagoons, which are facilities designed and built for the treatment of domestic and industrial liquid waste. In Cuba, these lagoons can be anaerobic, facultative and aerobic (Cubagua, 2007). However, conventional WWTPs are still the best alternatives for treating wastewater in highly urban areas where land is not readily available for lagoons. 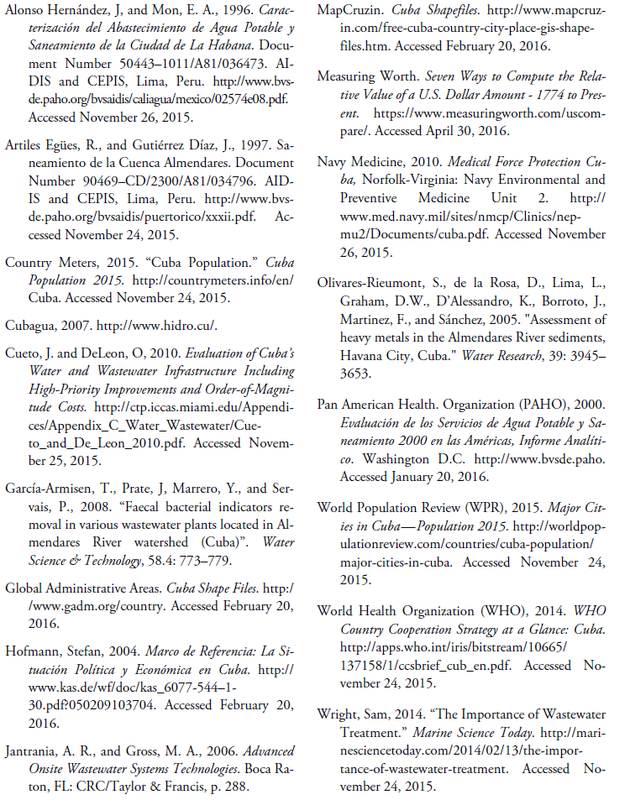 According to Cueto and DeLeon (2010), there is evidence of at least 11 WWTPs within Havana and Havana Province. However, only 18.9% of the volume collected is treated (PAHO, 2000). This situation explains the pollution of Cuba’s waterways and the subsequent health and environmental problems faced by the population. The capital Havana is the city for which there is the largest amount of available information regarding its wastewater systems. Havana’s wastewater system can be separated into two components: collection networks and treatment plants. Currently, there are five wastewater collection networks that consist of 1,570 km of sewer lines which service 55% of Havana’s population (Alonso Hernández and Mon, 1996). These wastewater collection networks are Sistema Central, María del Carmen, Cotorro, Cuenca Baja Río Almendares, and Alamar. Only the first three systems will be described in this study as well as Puentes Grandes, which is a wastewater collection network still under construction. Not much is known about the wastewater collection networks known as Cuenca Baja Río Almendares and Alamar. There are eight WWTPs within the city of Havana, which are María del Carmen, Sistema Central, Solar Aquatic System (Pilot Project), El Pitirre (Cotorro), Lower Luyanó, Upper Luyanó, Martín Pérez and Luyanó 3. One plant, Puentes Grandes, was planned but never constructed. Two others, making a total of 11 WWTPs, are Quibú and Bejucal; are outside the City of Havana but within Havana Province (see Table 1). There are two networks connected to wastewater treatment plants, namely Sistema Central and María del Carmen. Sistema Central has a length of 1,130 km, and it is the largest wastewater network in Cuba. The effluent from the network is discharged through an ocean outfall located 150 m offshore at Playa del Chivo. It services 945,000 people, though it was built to service only 600,000. It contains lines that were constructed nearly 100 years ago and are in need of repair and upgrades (Alonso Hernández and Mon, 1996). Wastewater is collected on the west side of Havana Bay and is treated via preliminary processes through coarse screens and grit removal (Figure 1). The effluent from this preliminarily treated wastewater flows via by gravity through a 2 m diameter, 400 m long pipe to the Casablanca pump station located on the eastern side of the bay. To remove accumulated sludge and sediment, the eastern half of the pipe is split in two which then allows the redirection of the flow to only the bottom half of the pipe creating extra velocity and shear to remove accumulated sediment and sludge. María del Carmen is the other network connected to a wastewater treatment plant in Havana. The WWTP was constructed over 50 years ago, and its effluent is discharged to the Almendares River. The collectors are operating below capacity due to the lack of wastewater collection lines upstream. The Cotorro (El Pitirre) and Puentes Grandes wastewater collection networks discharge untreated wastewater directly into the nearest water body. Cuba was granted a loan from the Organization of the Petroleum Exporting Countries (OPEC) for upgrading María del Carmen, El Pitirre and Puentes Grandes WWTPs. The El Pitirre WWTP was never integrated with its wastewater collection network and the Puentes Grandes WWTP was never constructed. The El Pitirre WWTP (Figure 2) was to service the wastewater collection for the City of Cotorro. However, the wastewater from Cotorro has never reached the El Pitirre site. This is due to the non-operating San Pedro pumping station (Alonso Hernández and Mon, 1996). From Cotorro, the collected wastewater is conveyed to this pumping station, where it should be pumped up to El Pitirre WWTP (Artiles Egües and Gutiérrez Díaz, 1997). However, due to a missing electrical panel, the sewage from Cotorro is discharged to the nearest waterways, which are the upstream reaches of the Almendares River watershed, thereby impacting the river system and ultimately the Vento aquifer, the main drinking water supply for the City of Havana (Olivares-Rieumont et al., 2005). The Puentes Grandes network is also very important, but the main trunk line and the WWTP planned to service it have been postponed due to funding limitations. The planned site for the Puentes Grandes WWTP was a large green area between the Ciudad Deportiva and the Papelera de Puentes Grandes (see coordinates in Table 2). 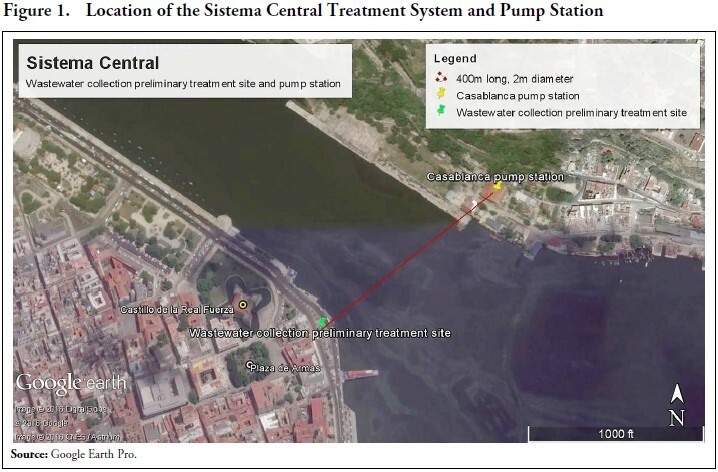 There are two wastewater treatment plants, Sistema Central and María del Carmen, within the City of Havana (Figure 2). Sistema Central is serviced by the biggest collection network, and the treatment of the wastewater is limited to some grit collection and course screening process (preliminary treatment). 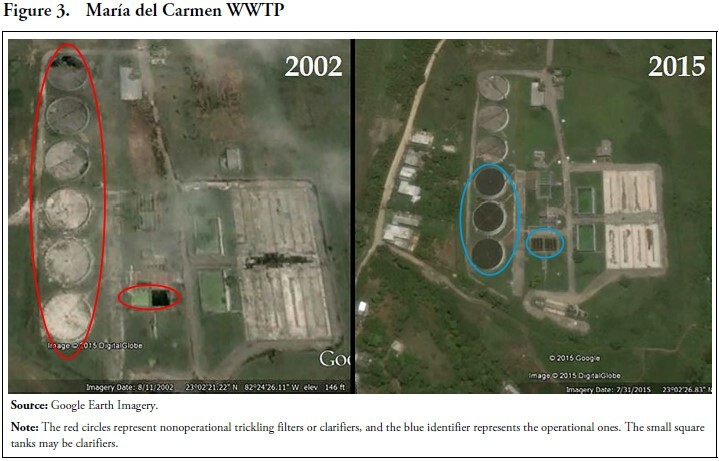 María del Carmen WWTP is servicing people with primary and secondary treatment, but it is in need of complete rehabilitation (Alonso Hernández and Mon, 1996). Secondary treatment is accomplished by trickling filters with rock media. The Solar Aquatic System plant (see Table 1) is an unconventional system and a small operational pilot wastewater treatment facility located in the region of the Almendares River. According to García-Armisen et al. (2008), it was built to treat the effluent of 5,000 inhabitants, but its exact location is unknown and little is known about its wastewater collection network. This plant was found in this study to be working efficiently. Furthermore, the Cuban government with the United Nations Development Program (UNDP) is developing another sanitation plan to improve the sanitary infrastructure around Havana Bay. The government has constructed four new WWTPs which are called Upper Luyanó, Lower Luyanó, and Luyanó 3, which are located along Luyanó River, as well as the Martín Pérez plant located on another tributary to Havana Bay, the Martín Pérez River (Cueto and DeLeon, 2010). The first two, whose locations are known, will be evaluated in the next section, while the last two will not be due the lack of available information at this time. 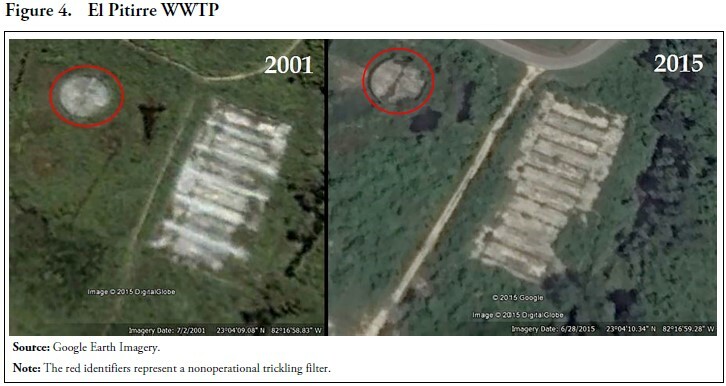 Six WWTPs were observed via satellite imagery using Google Earth Pro and compared to images from previous years in order to determine if any changes could be discerned visually. It is known that there are more WWTPs in the capital city, but here we will discuss only some of them because there is little or no information on the others. Four of the six WWTPs that were identified are located within the City of Havana. These are María del Carmen, El Pitirre, and two on the Luyanó River (Figure 2), which are referred to by Cueto and De Leon (2010) as Lower Luyanó and Upper Luyanó. The additional two are located within the province of Havana in the municipalities of Bejucal and Quibú and so named for their location (Figure 2). The coordinates of each one of the WWTPs described in this paper are shown in Table 2. Coordinates for the remaining three plants listed in Table 1 were not available. The most recent imagery of the María del Carmen WWTP was taken on July 31, 2015. The earliest imagery available with a clear picture is from August 11, 2002 (Figure 3). The images show six circular tanks. It is speculated that all six are trickling filters due to the cross-arms observed which spread the influent at the top of the media. However, some may also be settling tanks, also known as clarifiers. The small square tanks highlighted by smaller red and blue identifiers may be clarifiers. The white areas to the right of the images appear to be sludge drying beds. In 2002 none of the six circular units appeared to be in service. In 2006 and as recently as in the 2015 image, three out of the six units appeared to be back in service. The small square one seemed to be partially functioning during 2002 and fully operating during 2015. Maintenance seems to have been performed between 2002 and 2006, but not enough to bring María del Carmen to its full capacity. El Pitirre is the WWTP that was to receive wastewater from Cotorro via a pump station. The circular area appears to be set for a trickling filter or a clarifier. The area to the right appears to have been cleared for sludge drying beds. The most recent satellite imagery is from June 28, 2015, while the earliest satellite imagery is from July 2, 2001 (Figure 4). It seems from the latest image that this plant is under construction and non-operational. 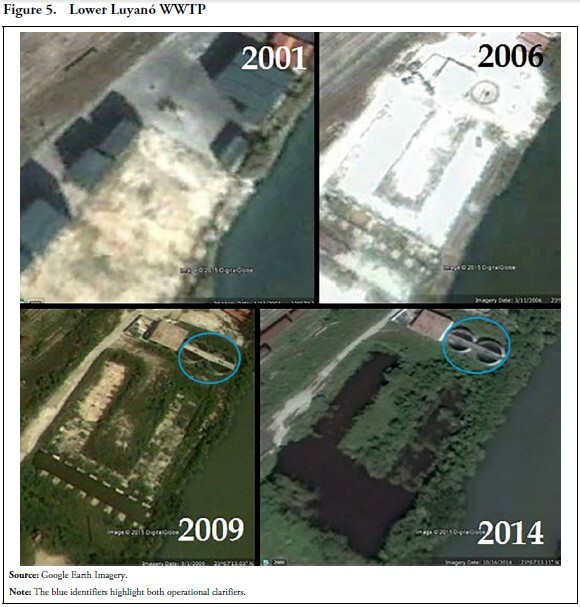 Visually, in the fourteen years of available satellite imagery it seems that essentially nothing has changed in terms of construction or performing maintenance. Lower Luyanó is one of three plants being operated in collaboration with the UNDP to help improve water quality in Havana Bay. Four images were compared from 2001, 2006, 2009, and 2014 (Figure 5). Construction began recently enough for various stages to be captured by Google Earth. 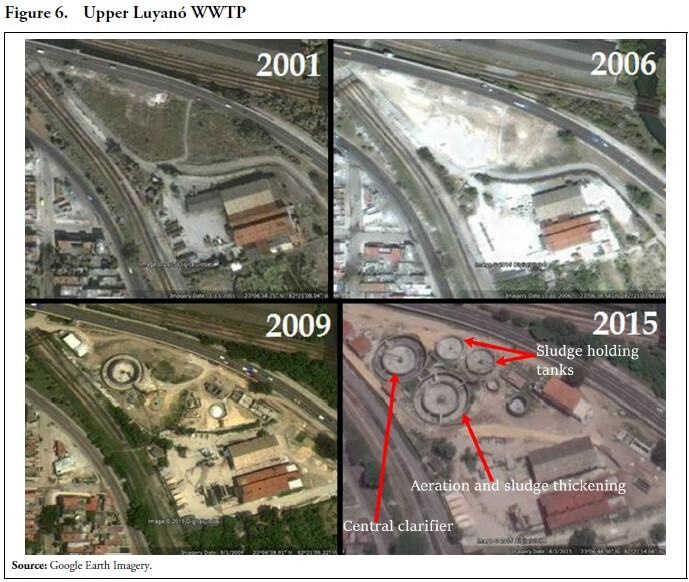 On January 13, 2001, the site of the WWTP was empty except for what appears to be storage sheds. By March 11, 2006, excavation had begun and the WWTP construction was underway. By September 1, 2009, the WWTP was operational, as identified by water in both circular clarifiers. 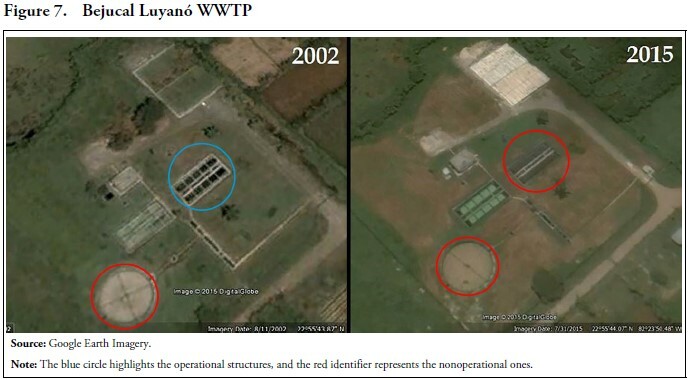 By October 16, 2014 the rectangular portion of the WWTP (perhaps sludge drying beds) also appeared to be operational, although only the outer portions. The inner portion of the rectangular units is not operational and not consistent with their apparent original design as shown in Cueto and DeLeon (2010). Upper Luyanó, upstream of Lower Luyanó on the Luyanó River, is another WWTP that is being operated in collaboration with the UNDP to reduce the contamination of Havana Bay. This plant appears to consist of two conventional plants, as shown by the two large circular tank systems, with central clarifiers and aeration and sludge thickening in the annulus around the clarifiers. The smaller circular tanks appear to be sludge holding tanks. Four images were compared from 2001, 2006, 2009, and 2015 (Figure 6). On January 13, 2001 the site of the WWTP was undeveloped. By March 11, 2006 the site was being prepared for construction. By September 1, 2009 construction was in progress, and at least one clarifier and a few other new structures appear to have been built. The most recent imagery from August 3, 2015 indicates that construction was still in progress. Although it appears that the majority of the structures were in place at that time, they were not operational yet. Bejucal WWTP is situated in the municipality of Bejucal which is located within the province of La Habana. The circular tank on this site could be either a clarifier or a sludge thickener. The rectangular tanks highlighted may be Imhoff tanks designed to settle the wastewater and provide sludge digestion. Satellite imagery of this plant was observed from August 11, 2002 to July 31, 2015 (Figure 7). Information is not available on when this plant was built, but from the images we conclude that this plant has clearly been non-operational for over 13 years. The observed changes include the possible construction of drying beds in the northern corner and it appears that the rectangular tanks in the center of the image were once in service and are now empty. Quibú is located outside the city and within the province of La Habana (Figure 2). Its design is similar to that of María del Carmen. The circular tanks appear to be trickling filters. The small square tanks are either clarifiers or sludge thickeners. Drying beds are located to the west. As of October 17, 2000 the plant was fully operational. As of September 2013 the plant appeared to have maintenance shortcomings (Figure 8), apparent in the shutdown of one trickling filter. These maintenance issues were not resolved as of the most recent satellite image in April 23, 2015, which also shows one inoperative trickling filter. In summary, of the six plants evaluated through Google Imagery, none appear to be functioning at full capacity. Three appear to be working at partial capacity (María Del Carmen, Lower Luyanó, and Quibú). Three do not appear to be functioning at all (El Pitirre, Upper Luyanó, and Bejucal). Absent an opportunity to visit the WWTPs to make a needs assessment of the existing treatment units and land availability for any additional units, it is not feasible to estimate the cost of bringing each facility to a satisfactory state to provide the degree of treatment for which it was designed. The analysis of degree of treatment required is a complex matter requiring mathematical modeling of all sources of pollution, including so-called nonpoint sources (e.g., storm water runoff from various land uses), the fate of pollutants in receiving waters, and an iterative process leading to the determination of Total Maximum Daily Loads (TMDLs). Given these unknowns, we believe it is useful to develop a cost estimate for the alternative of brand new WWTPs providing secondary treatment. The alternative of new WWTPs is developed in the next section. There are two general types of wastewater management strategies: decentralized and centralized. The main goal of the first type is to manage (treat and disperse or reuse) wastewater at or near the source where it is produced. It also normally releases effluent into soil or on top of land. It includes latrines, also known as privies or outhouses, as well as septic tanks and leach field systems. Centralized systems manage the wastewater in a central location which is generally far away from the place where it is formed. The effluent is released into surface water bodies, such as oceans, rivers, streams, or creeks (Jantrania and Gross, 2006). They include a wastewater treatment plant on the order of tens or hundreds of thousands of gallons per day (small-scale) and a traditional community based wastewater treatment operation (larger scale). Initially, a combination of these systems in Havana will be inevitable. However, the eventual goal should be implementation of large scale WWTPs made up of different unit processes using modern, cost-effective technology. There are three levels of treatment. Primary treatment focuses on the removal of suspended solids (SS) by 50–60% and biochemical oxygen demand (BOD) from wastewater by 20–30%. Secondary treatment focuses on the removal of most of the overall BOD by 70–90%. Tertiary treatment focuses on the removal of nutrients (mainly phosphorus and nitrogen), as well as most of the remaining SS and BOD from wastewater. The first step in sizing facilities and ultimately estimating costs is to determine the wastewater flow rate. The wastewater flow was estimated considering the population of Havana. Also, as a check, measured flow at the submarine outfall at Playa del Chivo was multiplied by two, as it is believed that this system serves about half of the population of Havana. Thus, the flow of wastewater in the city can be projected at about 130 million gallons per day (MGD). Given that the population of Havana is 2.2 million people, this estimate corresponds to a flow of 59 gallons per person per day. This number is low on a per population basis and may be due to a combination of low water usage rates and other complex factors. Pending a future investigation of usage rates and other considerations, we used the 130 MGD figure. This cost estimate was calculated assuming that four new plants could be constructed. These plants would need to be connected to wastewater collection networks. Mr. Peter Robinson, P.E., of Hazen and Sawyer provided cost curves (Figure 9) for primary and secondary treatment. The estimates for one plant of 32.5 MGD capacity (130 MGD÷4) is shown in Figure 9 according to his suggested approach. To use the cost curves proposed, 32.5 MGD was converted to m3/s, which corresponds to 1.42 m3/s. Using this value on the horizontal axis of Figure 9 a unit cost for primary treatment of $0.22 and for secondary of $0.47 was estimated on a per liter per day basis. Then, the plant flow in MGD was converted to liters/day and multiplied by the corresponding unit costs, resulting in the 1998 values shown in Table 3. The final costs were then converted to 2015 values accounting for inflation by using information from the website https://www.measuringworth.com/ uscompare/. The 2015 values shown on Table 3 were increased by 20% for engineering, legal, and contingencies, plus 10% for fiscal cost and inflation (Table 4). 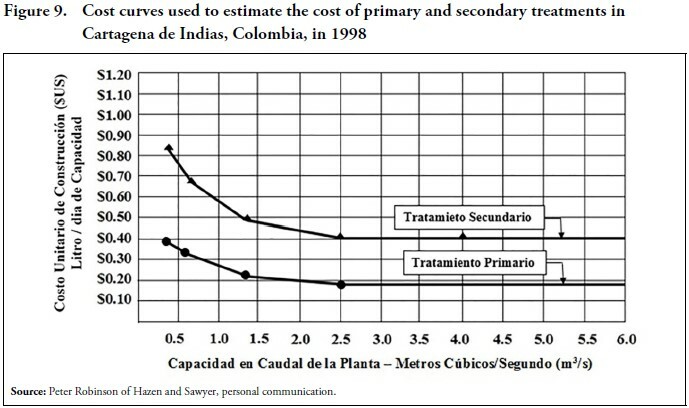 The unit cost for secondary treatment includes primary, so it was subtracted from the primary cost. Thus, primary treatment would be $59,150,000, and secondary would cost $67,080,000, for a total of $126,230,000 per plant. Considering the present situation of the Cuban economy, tertiary treatment was not considered because it represents a classical point of diminishing returns. This means that every incremental removal of SS and BOD entails a greater and greater incremental cost. However, tertiary treatment would be desirable later on in the future once it offers a higher environmental protection in sensitive areas. The total cost for all the four WWTPs would be $504,920,000 which may be out of the current financial reach of the Cuban government’s budget (Table 4). However, it may be fulfilled in phases, as the economy of Cuba hopefully improves. Over the years, Havana has faced deficiencies with its wastewater system. As explained above, most of the WWTPs are either not operating at full capacity, or they are not functioning at all. Also, some of the WWTPs are still under construction, and therefore they are not operating yet. The wastewater collection system needs repairs and upgrades, which are not quantified in this paper due to insufficient data. The necessity for improvements is urgent since the lack of adequate wastewater treatment has caused several environmental problems such as the pollution of Havana Bay and the Almendares River. One option for wastewater treatment would be to build a new WWTP at each of the four main wastewater collection service areas to supply the overall needs of the population of Havana. It is not known whether this approach will be preferable to that of upgrading the existing plants, the analysis of which would require on-site visits to the plants and detailed assessments of the conditions of the treatment units vis-à-vis desirable treatment performance. Meanwhile, the assumption of new wastewater treatment plants serves to provide an order-of-magnitude yardstick for evaluating economic considerations. 1. Editor’s Note: This essay was awarded First Prize in the 2016 ASCE Student Competition for undergraduate students. 2. The authors would like to acknowledge the endless support and help of Dr. Helena Solo-Gabriele (University of Miami). She kindly read our ideas and offered her contributions for the theme of this paper as well as for style and organization. We also greatly appreciate the information offered by Rafael Artiles Egües about the structure and functioning of some WWTPs. In addition, we thank Dr. Armando I. Pérez and Josenrique Cueto for graciously reviewing and providing excellent comments and suggestions on this manuscript. We also thank Jhonata Silva for his contributions in map construction.